S0724. ARTHUR GRUMIAUX, w. Szell Cond. Concertgebouw Orch. 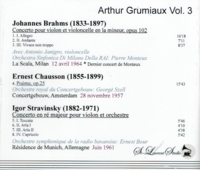 : Poème (Chausson), Live Performance, 28 Nov., 1957; w.Bour Cond.Bavarian Radio S.O. 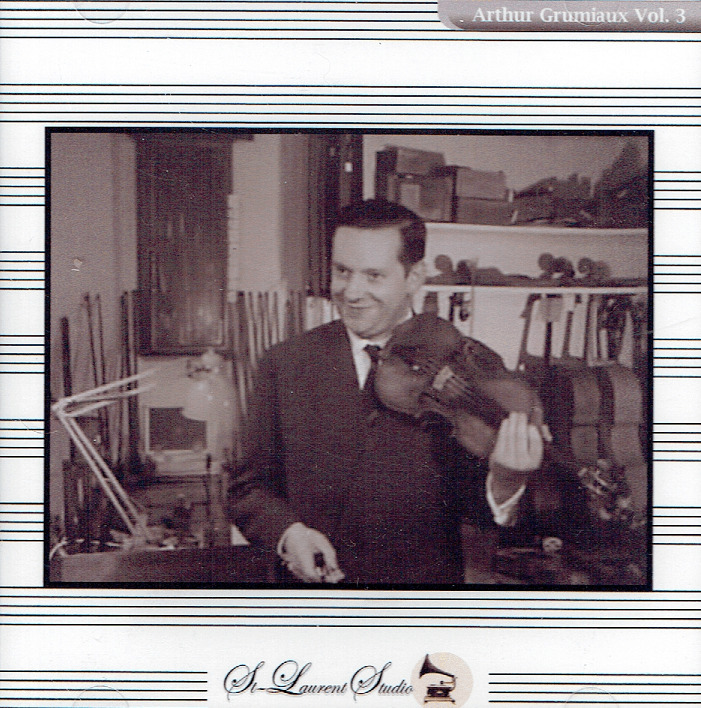 : Violin Concerto in D (Stravinsky), Live Performance, 1961, Munich; ARTHUR GRUMIAUX & ANTONIO JANIGRO, w. Monteux Cond. 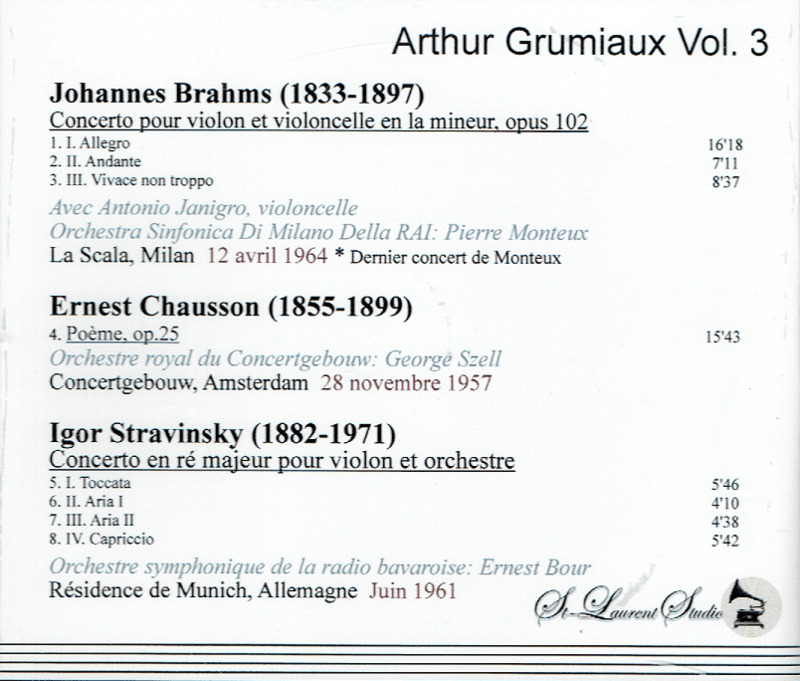 RAI S.O., Milano: Double Concerto in a (Brahms), Live Performance, 12 April, 1964 (Monteux's final performance). [Chausson's 'Poème' is the pièce de résistance - a ravishing performance!] (Canada) St Laurent Studio YSL T-638. Transfers by Yves St Laurent. “Italian-born conductor and cellist Antonio Janigro is best known to contemporary audiences for his many recordings with the chamber orchestra I Solisti di Zagreb, an ensemble he founded in 1954. Staples of the record-store Baroque section for many years, they helped build the enormous popularity that has since come to the music of Vivaldi and his contemporaries, and they still hold up well as widely available reissues. Janigro came to Baroque music fairly late in life, however. His recordings as a conductor capped a musical career touched by two world wars. Janigro once described the atmosphere of his childhood as musical but tragic. He was born in 1918 in Milan to a pianist father whose career had ended when he lost an arm to a sharpshooter in World War I. Janigro started out on piano but switched to the cello at age eight, winning admission to the Verdi Conservatory a year later. At age 11 he performed for Pablo Casals, who recommended Janigro for admission to the prestigious École Normale de Musique in Paris. Studying there in the mid-1930s, he had Casals and Nadia Boulanger as teachers, Dinu Lipatti and Ginette Neveu as classmates, and Stravinsky as an eminence. His repertoire as a performer would range from early music to brand-new compositions. Practicing his cello on a train from Paris to Milan, Janigro was heard by a talent agent, and his career was launched.